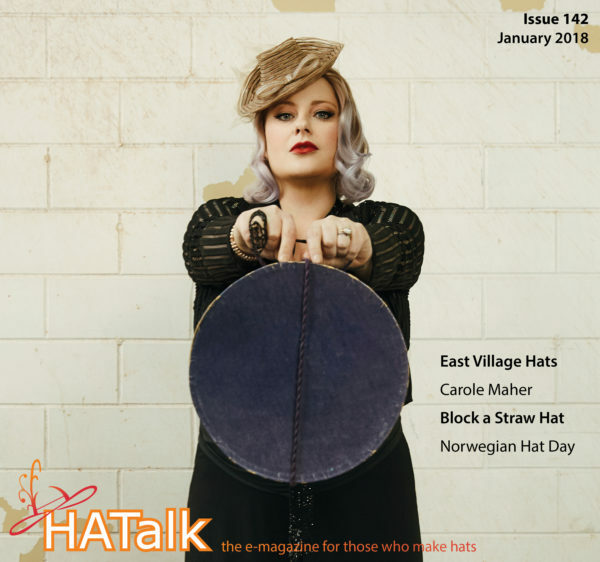 As a HATalk subscriber, you can download any issue of HATalk e-magazine ever published as many times as you want to at no extra cost. Simply click on the ‘Download’ link underneath any issue and the download process will begin automatically. 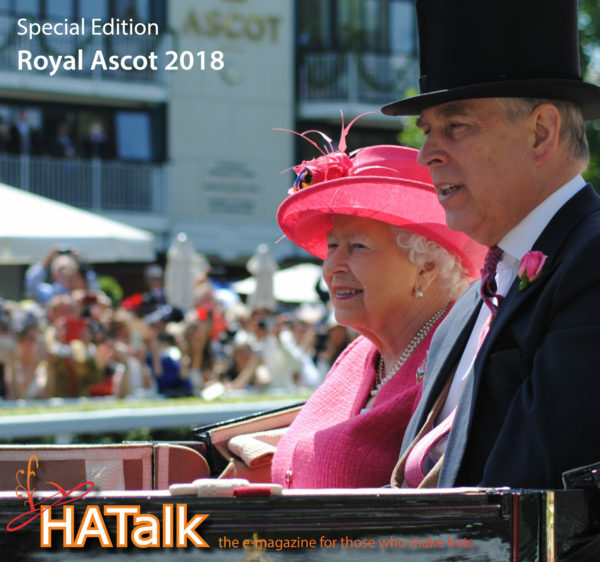 To see all HATalk Special Editions, including Royal Ascot Issues, click here. 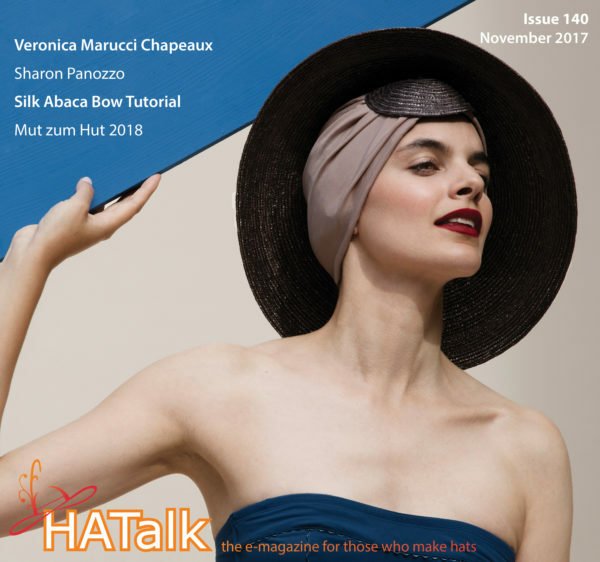 2019 HATalk Competition: Meet the five talented winners. Racing Fashion: Rachel Oakes’ award-winning Cheltenham ensemble. 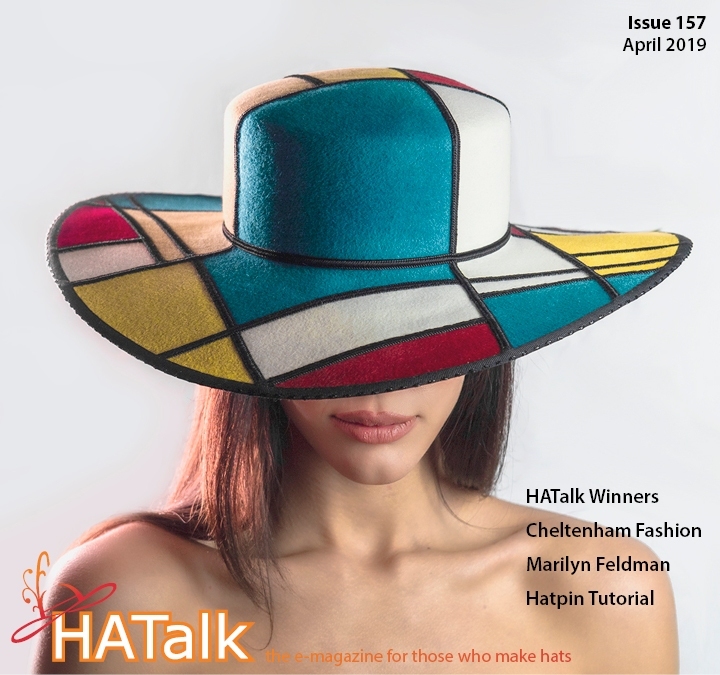 Hat of the Month: A Glamour Project hat by Marilyn Feldman. How to Make a Hat Shaped Hatpin: Recreate an Edwardian hatpin with Lynn McMaster’s step-by-step tutorial. Stepping into the Past: Michael Hayle’s memories of the final days at Christys’ Hat Works in Stockport. Hat of the Month: A sinamay and silk abaca saucer by Joan Walker. Leather Camellia Tutorial: A step-by-step guide from Galina Kofod. Supplier Spotlight: A brief history of Dutch millinery supplier Plooij Hats and Materials. 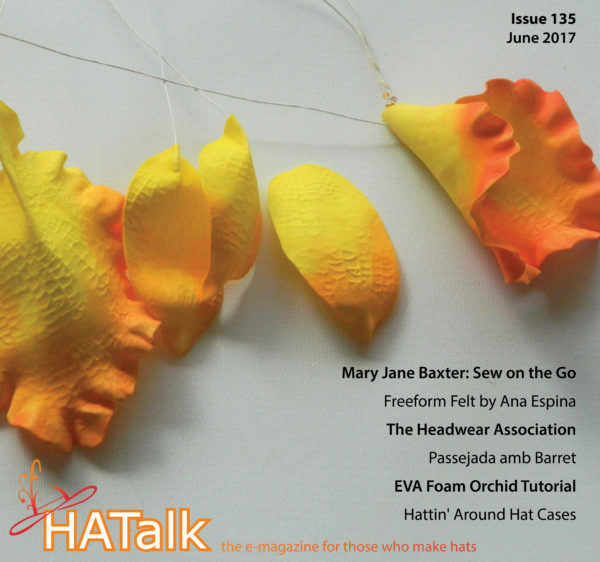 Talking Hats with Amy Fowler: An interview with the American milliner and owner of Humboldt Haberdashery. Curled Feather Peony Tutorial: Step-by-step instructions for making a curled goose feather flower. Hat of the Month: A wired wedding headpiece by Kristi Hilton Pickup, the HARROGATE HATTER. 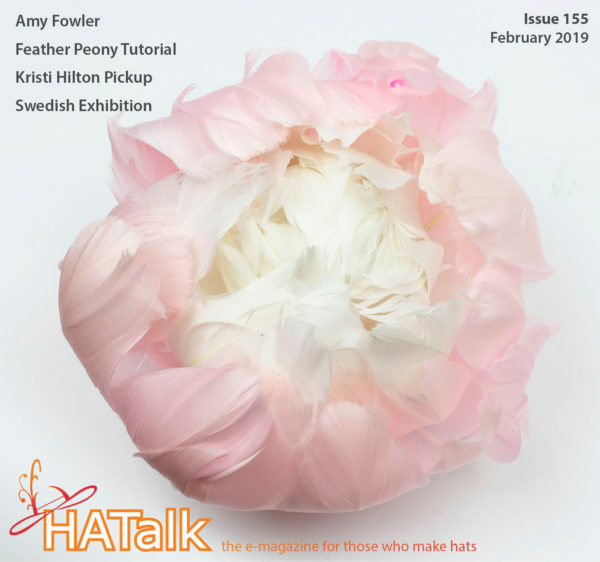 Hats as Art: Annette Sedin exhibits in Sweden. Saint Catherine’s Day 2018: Millinery celebrations around the world. Hat of the Month: A silk turban by Dutch milliner Joke Velema. 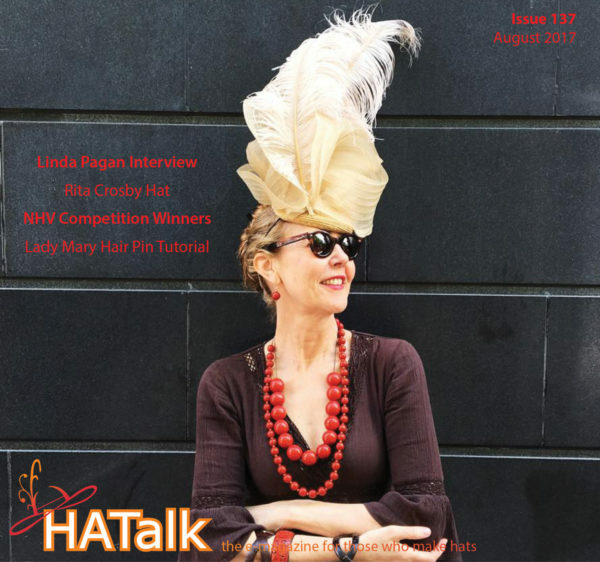 Hattember: A look at the winners of the new Australian hat making competition. Make a Biot Bird: A feather trim tutorial by Lynn McMasters. 2019 Pantone Color of the Year. Hat Shop Madison: An interview with Monika Stebbins, owner of New Jersey’s Hat Shop Madison. Hat of the Month: A handmade shot silk headpiece by millinery student Bethany White. Spartre, Old and New: A comparison of European and Japanese spartre by Rachel E. Pollock. Melbourne Cup Carnival: 2018 Myer Fashions on the Field competition winners and new digital format. Millinery Meet-up 2018: A report from the popular American hat making event. Hat of the Month: A vintage beaded bridal headpiece by Anna Gilder. Double Diagonal Headband Trim: A folded Petersham headband tutorial by Jan Wutkowski. Chapeau 2018: The annual hat and accessories trade show in Moscow, Russia. 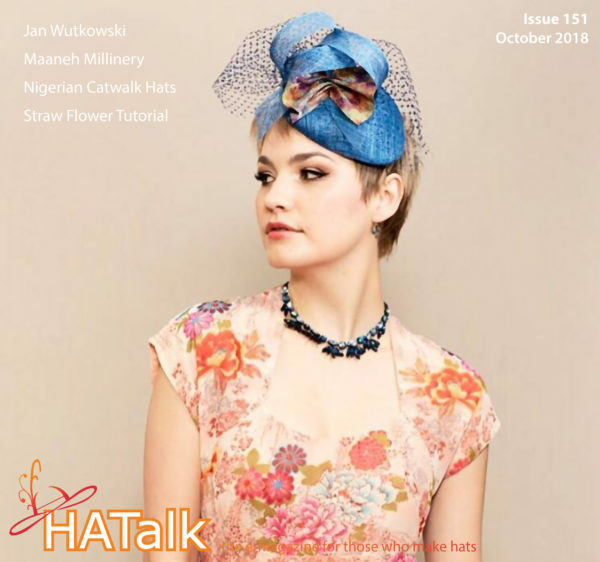 An Interview with Jan Wutkowski: In conversation with American hat designer and Millinery Meet-up co-founder. Hat of the Month: A pleated jinsin saucer hat by Nirali Rangwala of Maaneh Millinery in India. Hats on the Catwalk: Faustina Amaefuna at the Anambra Fashion Show & Awards. Straw Plait Flower Tutorial (Part 2): Recreate a 1960s straw flower ornament with costume expert Lynn McMasters. 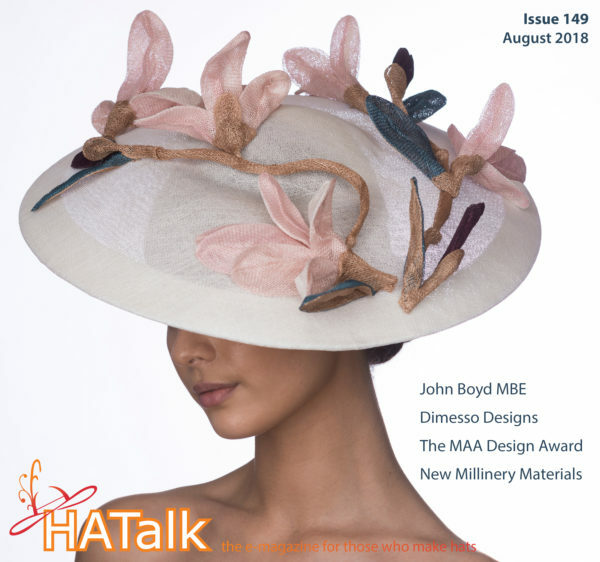 Hat Week Australia: Peggy Stone reports back from Australia’s new millinery event. 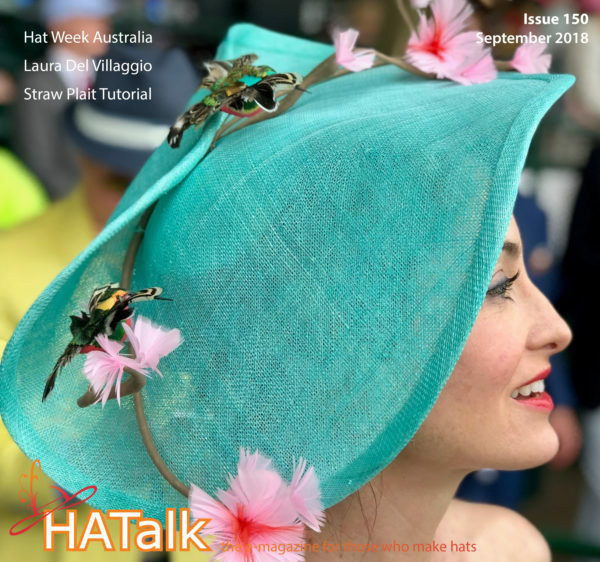 Hat of the Month: A closer look at Laura Del Villaggio’s hummingbird cover hat. Straw Plait Flower Tutorial – Part 1: Recreate a 1960s straw flower ornament with costume expert Lynn McMasters. John Boyd MBE: Words of wisdom from the late Mr Boyd. Hat of the Month: A Royal Ascot hat by Elaine Humble of Dimesso Designs. 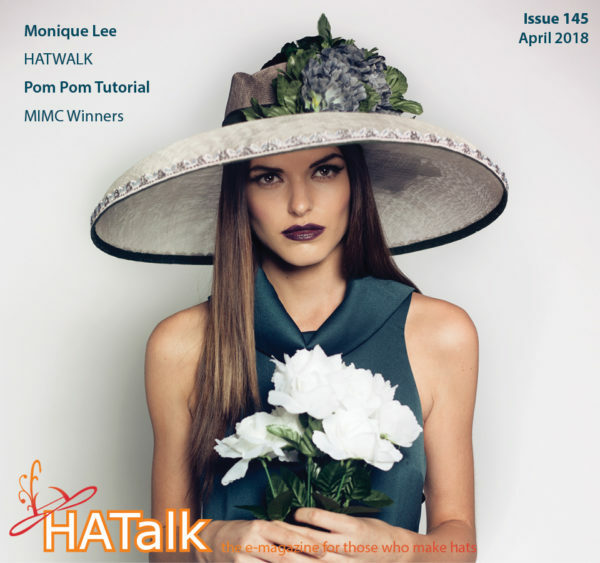 The Millinery Association of Australia: New Patron and the 2018 Design Award Winners. New Millinery Materials: A look at three innovative material ranges from LilyM Millinery Supplies. Royal Ascot 2018 Millinery Style and Hat Fashion. 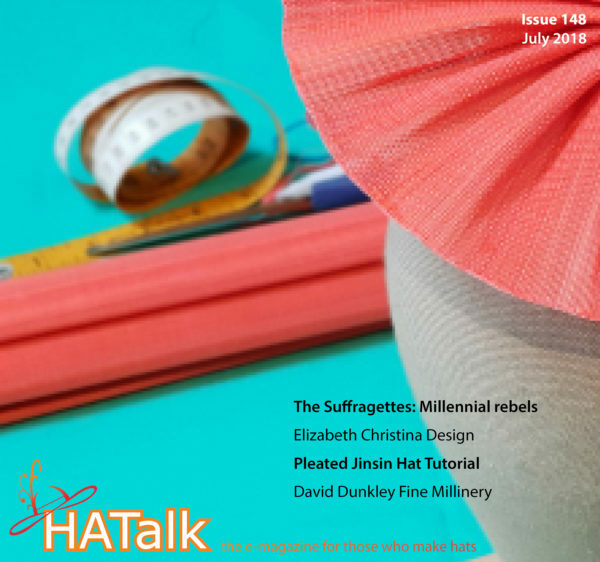 The Suffragettes: Millennial rebels: Hats to celebrate women’s voting rights from milliner Claire Strickland. Hat of the Month: A blocked veiling headpiece by Tina Hemlock Coyne of Elizabeth Christina Design. 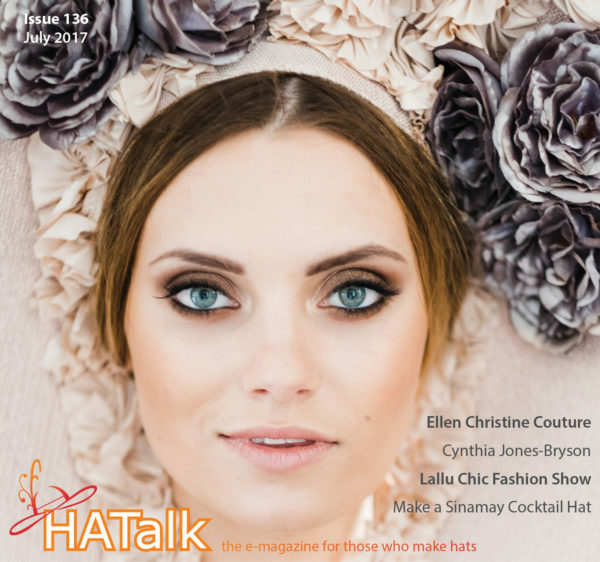 The Diorabella Tutorial : Learn how to make a pleated jinsin hat with Australian milliner Catherine Ellen. Queen’s Plate 2018: Looking ahead to Canada’s premier horse race with David Dunkley Fine Millinery. Kentucky Derby 2018: Churchill Downs style report from Briana Mott of Fashion at the Races. Hat of the Month: A sustainable golden halo by Chloë Haywood. Come Rain or Come Shine: Two springtime hat walks in Spain. Ribbon PomPom Tutorial: Make a velvet ribbon hat decoration with Lynn McMasters. 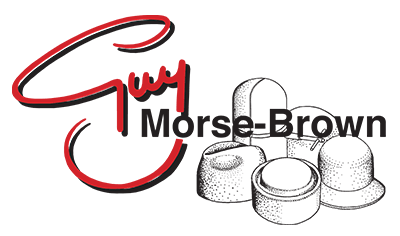 Tip: Curling goose biot feathers. 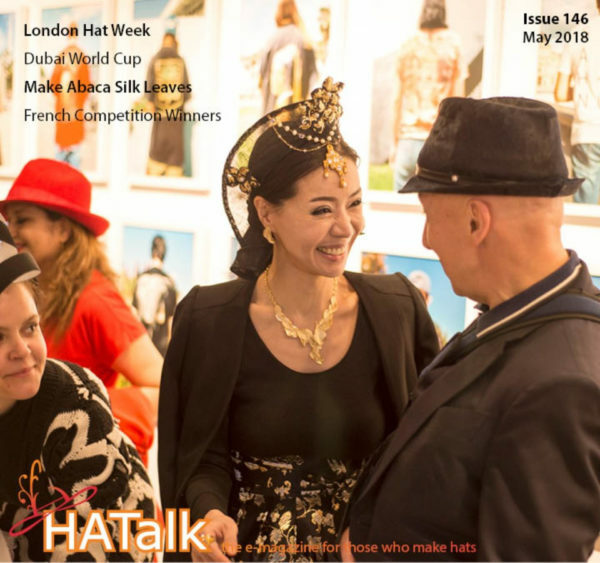 London Hat Week: Reporting back from LHW18. Hat of the Month: An award winning Dubai World Cup headpiece by Charlotte Hudders. How to Make Abaca Silk Leaves: A step-by-step guide from expert flower maker Anne Tomlin. Rencontres Internationales du Chapeau: The winners of the 2018 Chazelle sur Lyon hat competition. Monique: A profile of designer and marketing expert Monique Lee Hylands-White. Hats of the Month: Spotlighting the winners of Ireland’s HATWALK 2018 Design Awards. Feather Pom Pom Tutorial: An easy to follow feather tutorial by Lynn McMasters. Melbourne International Millinery Competition: A look at this year’s MIMC winners. Uncharted: An international fashion collaboration between Goorin Bros. and Hill Hats. 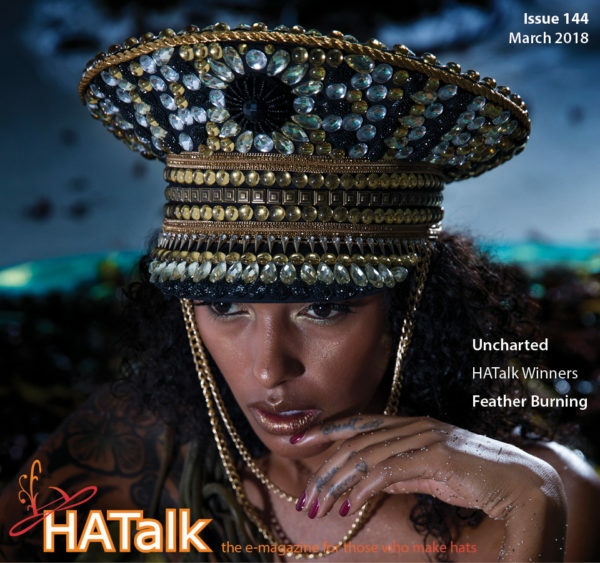 Hats of the Month: A closer look at the HATalk Competition winners and the people who made them. Feather Burning Techniques: A step-by-step feather tutorial by Lynn McMasters. How to secure headpieces discreetly. SHAPOH.com: An interview with Suzy Buckley Woodward. Hat of the Month: Another Melbourne Cup hat by Lisa Alexander Design. 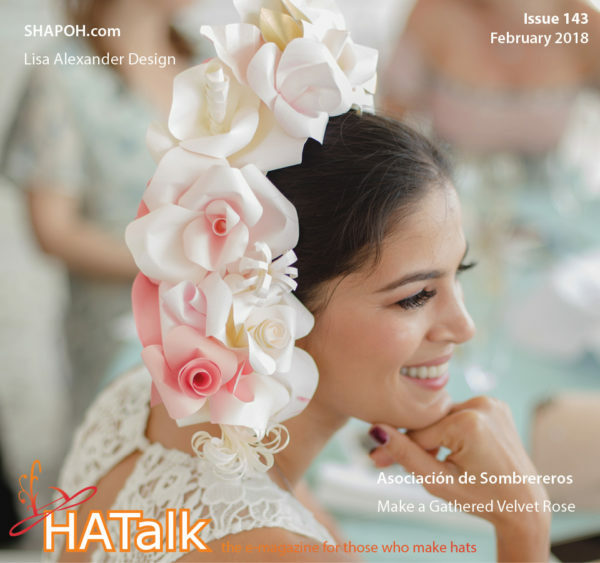 Asociación de Sombrereros: Details of the Spanish Hat Association’s winter events. Gathered Velvet Rose Tutorial: A quick and easy project by Lynn McMasters. East Village Hats: An interview with Julia Emily Knox. 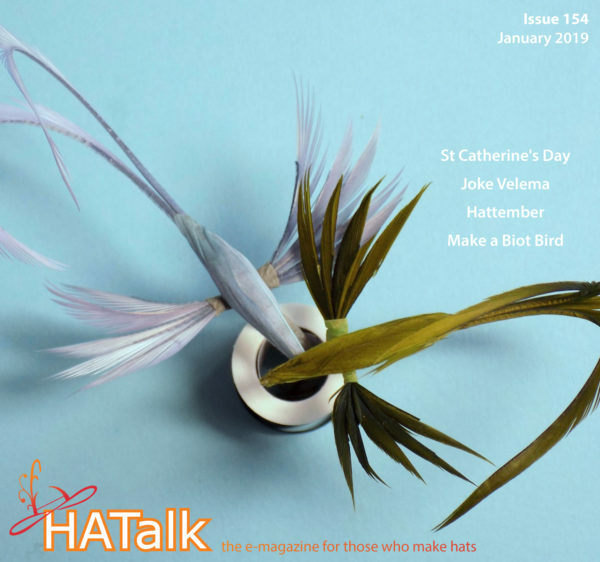 Hat of the Month: An award-winning hat by Australian milliner Carole Maher. Block & Sew a Sinamay & Straw Hat: A hat making tutorial by Jenny Pfanenstiel of Formé Millinery. Millinery wire guidance from Petershams Millinery Supplies. 2017 Melbourne Cup Carnival: Australia’s foremost racing fashion event. Hat of the Month: A multicultural headpiece by Kizzy McKeown. Lomax & Skinner: An interview. 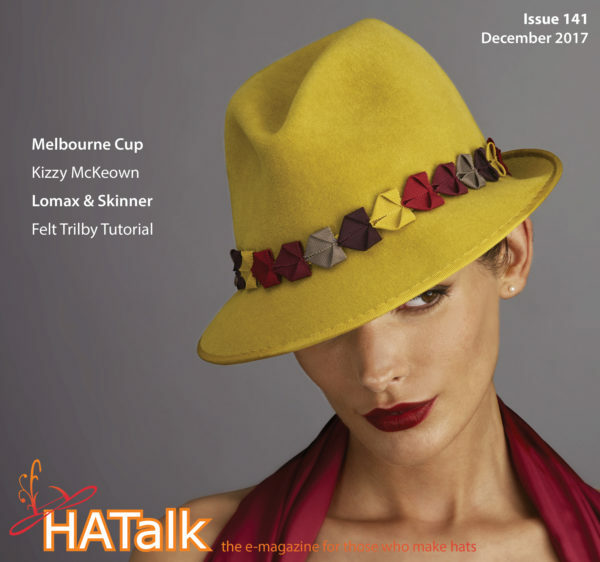 Felt Trilby Tutorial: A step-by-step project guide from Lomax & Skinner. Advice on curling felt brim edges. Veronica Marucci Chapeaux: Handmade in Paris. Hat of the Month: A Victorian reproduction by Sharon Panozzo. How to Make a Silk Abaca bow: A tutorial by British milliner Justine Bradley-Hill. Mut zum Hut: Ruth Eberz reports back from Neuburg an der Donau. 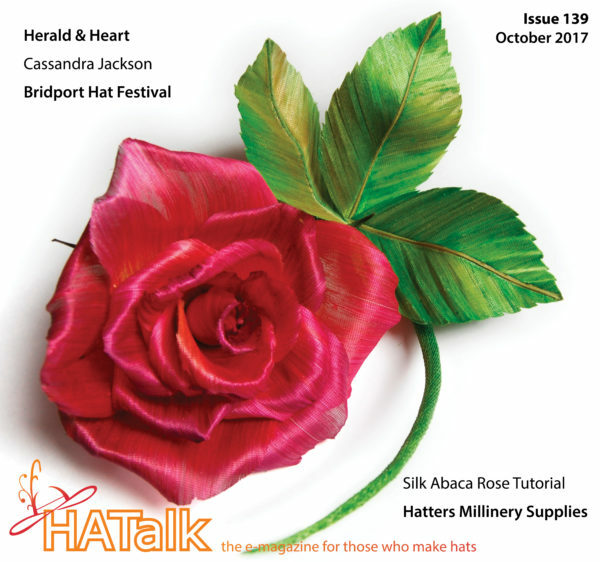 Herald & Heart: An interview with hat shop manager Sophie Dallison. Hat of the Month: A double-brimmed felt hat by Cassandra Jackson. Bridport Hat Festival 2017: Milliners and Hatters Open Competition winners. Abaca Silk Rose Tutorial: A step-by-step guide from expert flower maker Anne Tomlin. Handing Over the Braids: Hatters Millinery Supplies new ownership. The British School of Millinery: Headdress Competition Winners. Feather Fashions: Millinery & the Plume Trade. Ethical Millinery: UK hat brand Warrillow goes vegan. Vegan Feather Tutorial: Rachel Warrillow shows you how to make sinamay and fabric feathers. Hat of the Month: A sinamay hat by Olushola Christine Adeyanju in Nigeria. 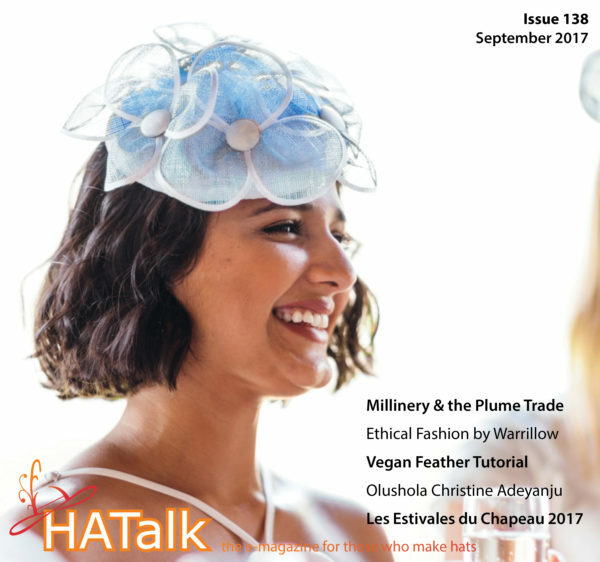 Les Estivales du Chapeau 2017: The winners of this year’s French hat making competition. Advice on sourcing ethical millinery supplies. The Hat Shop NYC: An interview with Linda Pagan. Hat of the Month: A classic downturned sinamay hat by Rita Crosby. 2017 NHV Hat Competition: A close up look at the winning hats. Lady Mary Hair Pin Tutorial: Denise Innes-Spencer’s step-by-step guide to making a bridal hair pin. Where to buy millinery trimmings in New York City. An interview with New York City milliner Ellen Christine Colon-Lugo. Hat of the Month: An award-winning Kentucky Oaks headpiece by Cynthia Jones-Bryson. Lallu Chic Fashion Show: Hania Bulczyńska’s stunning Polish catwalk event. How to Make a Veiled Sinamay Cocktail Hat by Molly Bunce. From Hearts to Hats: Denise Innes Spencer’s new tiara making book. Instructions for making a wooden hat display stand. 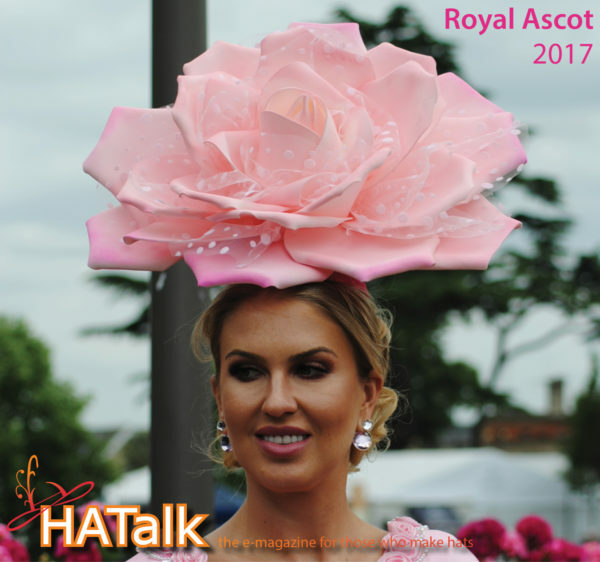 Royal Ascot 2017 Millinery Style and Hat Fashion. Sew on the Go: A crafting adventure by Mary Jane Baxter. Hat of the Month: A freeform felt piece by Ana Espina. The Headwear Association: Reporting back from the 109th Annual Dinner in New York City. Passejada amb Barret 2017: Strolling with a Hat in Barcelona. Make an EVA Foam Orchid: Step-by-step instructions from expert maker Galina Kofod.